Justin Jackson runs with the ball. The senior running back carved up 166 yards against Minnesota on Saturday. At the same stadium where he ran for more than 2,500 yards over four seasons and became a fan favorite known ubiquitously as “The Ball Carrier,” Justin Jackson played one last game Saturday. The senior running back made sure it was a finale to remember. 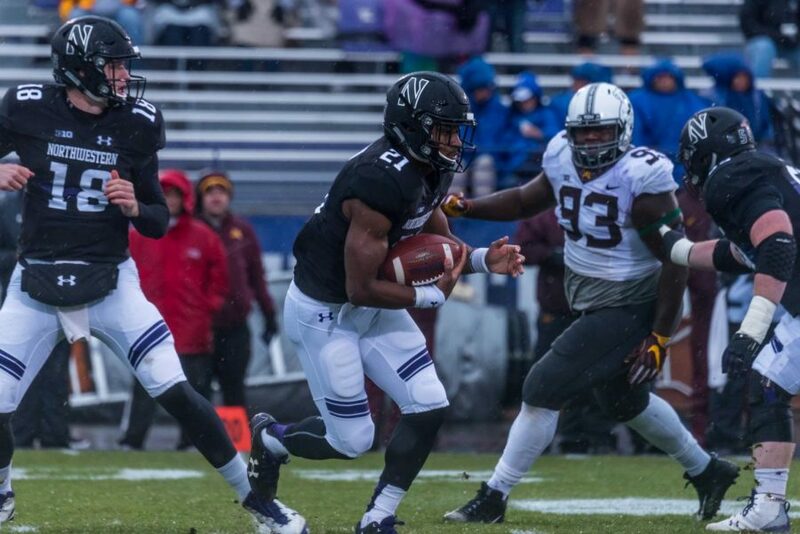 On a muddy, sleet-sodden Ryan Field turf, Jackson juked and cut his way to 166 rushing yards as the No. 23 Wildcats (8-3, 6-2 Big Ten) blasted their way to a 39-0 Senior Day victory over Minnesota (5-6, 2-6). The school’s all-time leading rusher hit a number of career milestones along the way against the Golden Gophers. He surpassed 5,000 yards for his career and cleared the 1,000-yard mark on the season, becoming the second tailback in Big Ten history to top that total in four straight seasons. Much of the damage Jackson inflicted on an overwhelmed Minnesota defense came in the first half, before the game got out of hand. Jackson picked up 76 rushing yards in the first quarter, including a 41-yard scamper, and he added 60 more in the second. Jackson carried the ball 24 times before halftime, while the Golden Gophers ran 21 plays total in the frame. Behind its senior bell cow, NU leapt out to a 25-0 first-half lead that allowed it to cruise to victory after halftime in the sloppy weather. “It was just kind of like a grade-school type game,” Jackson said. In a career marked by lofty rushing attempt totals, Jackson’s outing in his final home game seemed fitting. He tied his season-high for carries with 31, the 10th time he has run the ball 30 or more times since arriving in Evanston in 2014. After injuries hampered him early in the season, he has since rounded into the same late-season form he exhibited last fall. To close out that campaign, he ran for 173 yards against Illinois in the final game of the season before managing a career-best 224 at the Pinstripe Bowl. He never found the end zone Saturday, setting up scoring drives but not finishing them, and Thorson said he would have liked to see the halfback get a touchdown. But Jackson said neither the lack of a score nor the messy conditions took away from his final contest at Ryan Field.